Let’s face it. Rick Sanchez has one glorious unibrow! It’s not the sort of thing that a guy can grow naturally. We assume that Rick uses some sort of device to cultivate such a perfect eyebrow like that. Then, there’s his hair! We all know that you can’t be a mad scientist without crazy hair. Isaac Newton, Albert Einstein, and Rick Sanchez—all of the greats in history tend to have a messy mop of a hairdo. Oh, and a lab coat is a total must! Legit and mad scientists alike often wear them, so if you plan on heading out on wacky adventures, or if you plan on crafting some kooky inventions, then you’re going to need that iconic look. So, how can you achieve that glorious look without the advanced gadgetry of Rick? Do you need a genius IQ or a timid grandchild who will head on dangerous adventures with you? Nah. 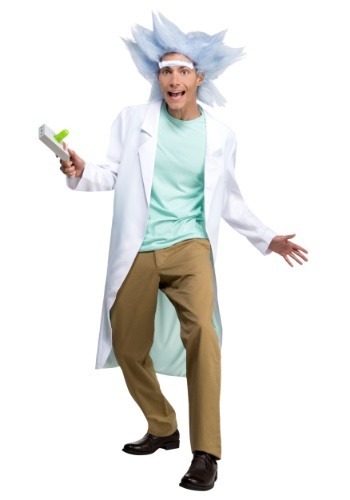 You just need this official Rick and Morty costume. This Rick Sanchez costume is based on the many appearances of the character from the Cartoon Network series. It comes with the long white lab coat, like the one worn by Rick in Rick and Morty. Of course, the real deal about this costume is the wig and monobrow set. The wig has plenty of white spiky hair to give you the maniacal hair of a mad scientist. The monobrow fits on your forehead, giving you Rick’s signature unibrow. When you dress up in this officially licensed Rick and Morty costume, you’ll be ready to live like Rick! You could create your own human anatomy-themed park or blast off to another planet. You could even infest the world with a new race of Cronenbergs with your brand new love potion concoction.